Still the Walleye Capital of the World? In the world of walleye fishing, Arkansas’ Greers Ferry Lake is hallowed water. This 31,500-acre U.S. Army Corps of Engineers impoundment in the Ozark Mountains near Heber Springs produced the all-tackle world record currently recognized by the National Fresh Water Fishing Hall of Fame, a 22-pound, 11-ounce walleye caught by Al Nelson on March 14, 1982. Local fisheries biologists give reliable reports of walleyes nearing, perhaps exceeding, this benchmark, that have been captured and released during Greers Ferry walleye studies in recent decades. Greers Ferry and its tributaries probably have produced more 20-pound-plus walleyes than any other bodies of water. 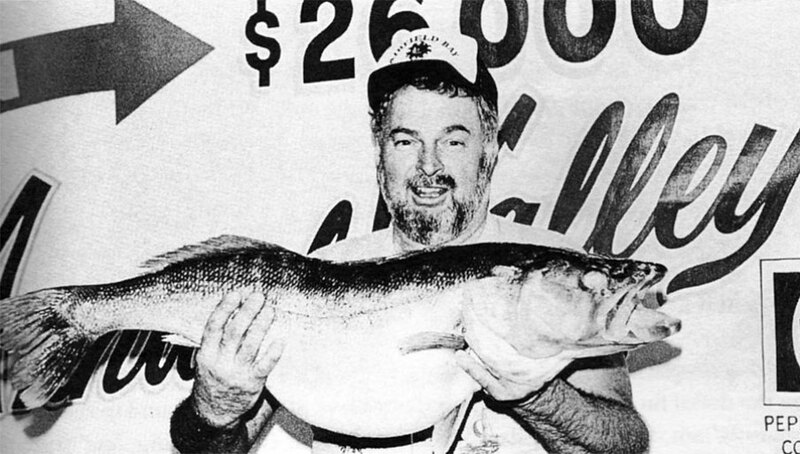 Nelson’s gargantuan fish topped a 21-pound, 9-ounce state record caught by Ed Claiborn in March 1979. The record prior to that was Mrs. Neva Walters’ 20-pound, 6-ounce Greers Ferry walleye caught in November 1979. Another extraordinary fish was a 20-pound, 9-ounce walleye caught by Thomas Evans on February 10, 1989. 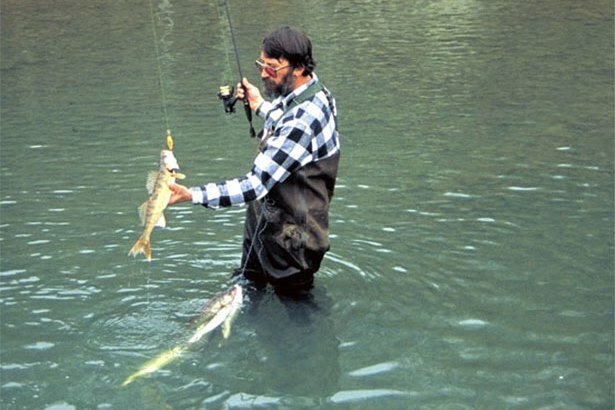 That walleye, caught in the Devil’s Fork of the Little Red River just above the lake, is the 20-pound world line-class record listed by the International Game Fish Association. To put this all in perspective, consider the fact that 20-pound-plus walleyes have been reported from only a handful of states besides Arkansas—Missouri, Kentucky and Tennessee among them. But no other state can boast the number of giants taken from Greers Ferry in years past. Many people believe another world-record walleye could be caught here, including Tom Bly. The record-sized walleye Bly saw was released alive into Greers Ferry. Bly, you see, is a fisheries biologist with the Arkansas Game and Fish Commission, and that huge fish was captured and stripped of its eggs during the Commission’s annual walleye project, a project that provides the fertilized walleye eggs needed by state fish hatcheries to raise stocking-size fingerlings. Bly lives at Heber Springs and is involved with all aspects of walleye management on Greers Ferry. While he believes the lake could produce another record fish, he notes the chances are not as great now as they were in decades past. Bly and fellow biologists conduct electrofishing samples every spring when the walleyes make their annual spawning run. 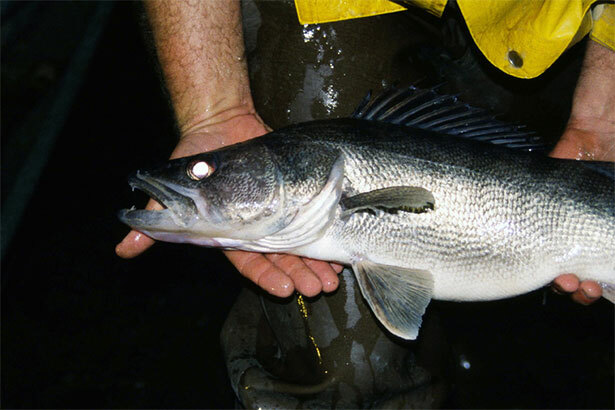 Their sampling has shown that the slot limit has had a positive impact on the population by increasing the numbers of walleyes seen in the slot limit. The Arkansas Game and Fish Commission helps maintain a healthy population with regular releases of fingerlings raised in a lakeside nursery pond. Roughly 400,000 young walleyes are stocked every other year in the lake and the upper forks of the Little Red River. Most walleye anglers fish Greers Ferry from mid-February through early April during the spawning season. When the water temperature approaches 50 degrees, walleyes ascend the four upper forks of the Little Red River: the South Fork, Devil’s Fork, Middle Fork and Archey’s Fork. Males arrive at spawning sites first and later are joined by females. Both sexes at this time occupy long, deep pools below swift riffles. Ripe adults move into shallow gravel-bottomed shoals to spawn at night. Bly says many anglers believe the large upper forks are the only place walleyes are likely to be caught, when in fact, other locations are equally productive during this season. Greers Ferry anglers also should know that this is not just a spring or spawning season walleye fishery. Walleyes can be caught here year-round. There are innumerable fishing tactics, lures and baits used to catch walleyes, and some are naturally more popular on Greers Ferry than others. Jesse Finch of Heber Springs caught a 16.4-pound walleye in late February 1991 while trolling a deep-diving Rebel Spoonbill Minnow crankbait, a very popular fishing technique here. Bottom-fishing with small live bluegills or creek chub minnows is a common and productive strategy, and according to Bly, a lot of good walleye anglers troll or vertical fish with jigs or jig/minnow combos. Some anglers fish from boats, but at spawning time, just as many settle onto their favorite section of river bank, fire up a lantern and watch their baits work lazily below the spawning shoals. Some wade-fish in the shoals. Is there a world-record walleye swimming in Greers Ferry? If so, will it ever be caught? The answer to both questions is “maybe.” The odds are certainly good that a new record will surface some day on this beautiful Ozarks lake, but it’s anybody’s guess when it might happen. Perhaps it will happen this year. Perhaps you’ll be the one who does it. Visit Greers Ferry and sample some of the best fishing for giant walleyes America can offer. Regulations: Walleyes from 20 inches to 28 inches long must be released immediately to the water. The daily limit is six, only one of which may exceed 28 inches. Walleye length and daily limits are also in effect for tributaries of Greers Ferry Lake. Additional regulations and licensing information are available on the Arkansas Game & Fish Commission website, www.agfc.com, or by phoning 800-364-GAME. Local amenities and fishing guides: Contact the Greers Ferry Chamber of Commerce, www.greersferry.com; or the Heber Springs Chamber of Commerce, www.heber-springs.com. Lake maps and information: Greers Ferry Project Office, www.swl.usace.army.mil/Missions/Recreation/Lakes/GreersFerryLake.aspx.